Rob Vincent has a unique, very focused view of things. I hope you’ll enjoy this guest post. What follows below is not in any way meant to make light of the horrible suffering recently inflicted on Russian civilians in Moscow earlier this week. They need to give independence to Chechnya. Not that there’s a lot of international pressure on them to do so. Where is the ‘Chechen Authority observers seat’ in the UN? Where are all the college protests, the boycotts, the divestment campaigns over the brutal Russian occupation of Chechnya (and it really has been pretty brutal, incalculably worse than anything Israel has ever done)? Where are all the UN resolutions condemning Russia? Has the UN Secretary General made a tour of Chechnya lately? I kind of doubt it. Why isn’t the Obama administration threatening some kind of sanction or another against Russia, standing up to them, over the poor oppressed Chechnyans? But why not? I mean, how about — dare I say it? — land for peace? A perfectly reasonable request, I submit. If it is good enough for tiny Israel, I’m sure Russia — which has more land to spare than anyone — could set the example. After all, they are a member of the Quartet that presumes to tell the Israelis what they must do for peace, aren’t they? It’s not as if independent Chechnya would be within mortar range of Moscow, or anything like that. And I’d bet they’d even recognize Russia’s right to exist as a Russian state right off the bat — more than it looks like Israel will ever get from the Palestinian Authority. But wait! The Russians already tried this! The Russians withdrew from Chechnya by the end of 1996, and by 1997, Chechnya had independence. That wasn’t enough for them, I suppose. Within a couple years, Islamic law was established; terrorism against targets inside Russia and invasions of neighboring territory followed. There’s just no pleasing some people. Russia wound up invading again to restore order, and, simply put, to protect themselves. When they did this, you can bet a lot more civilians died than in Gaza in early 2009. I imagine the Chechens would say that their aggression in the late 1990s was merely “revenge” for Russia’s past occupation. Hmmm. Wonder what lessons there could be for Israel in any of this? A great irony here, of course, is that when one considers the extent to which it is now becoming accepted U.S. policy to beat up on Israel so as to appease Muslim sensibilities in the hope of garnering the support of ‘moderate Muslims’ in our war against Islamist extremism… well, one could not find a more anti-Israel member of the industrialized major powers than Russia. Happily selling arms to all of Israel’s enemies, nuclear technology to Iran, the first of the non-Muslim countries to pounce on Israel every time in the UN, Russia’s policies towards Israel go well beyond Pat Buchanan’s wildest fantasies for the U.S. (but President Obama is doing his best). Beating up ferociously on Israel, betraying her at every opportunity — that surely hasn’t bought Russia anything, has it? You’d think Muslims would just love them, wouldn’t you? At least, that is what the logic that appears to inform the foreign policy of the Obama administration seems to indicate, no? So, where are the Muslim ‘moderates’, with whom Russia can cash in her Israel-bashing chits for help in fighting her Muslim ‘extremists’? As a Jewish American who is openly supportive of Israel, my sentiments are regarded by many with callousness and worse as concerns the deadly situation faced by my brethren in Israel. If I suggest that Israel is in the right against the murderous thugs who deny her very right to exist — which includes the gangsters with whom the world expects her to negotiate ‘peace’ – then I am “taking sides”, I’m a “Jew with a biased agenda”, I’m “putting our troops in danger”, I’ve got “dual loyalties”. But in the case of Russia, nobody questions her position, and you can be sure the Russian reprisal — as always — will be blunt and brutal. I somehow don’t think she’ll be condemned for this. When Israel is similarly attacked by the very same types, and has the audacity to defend herself (with far greater restraint and precision in every instance), she is treated by the overwhelming majority of the Western media as though she were to blame. Who could blame any Israeli or any Jew for being callous in the face of the suffering of the Russians today, given the repulsive evolution of public debate concerning Israel over the past couple of decades, and specifically given Russia’s treatment of Israel on the world stage? And yet, it would not surprise me in the least if Israel offered her assistance to Russia in fighting these thugs all the same. I don’t know why I keep expecting better from Friedman. But his recent op-ed in the NY Times puts him squarely on the Dark Side. Sometimes the brightest guys can’t see their noses in front of their faces. I’m going to quote him at length. As you read this, ask yourself a) what he is leaving out, and b) what he assumes about Israeli intentions and character. The collapse of the Oslo peace process, combined with the unilateral Israeli pullouts from Lebanon and Gaza — which were followed not by peace but by rocket attacks by Hezbollah and Hamas on Israel — decimated Israel’s peace camp and the political parties aligned with it. At the same time, Israel’s erecting of a wall around the West Bank to prevent Palestinian suicide bombers from entering Israel (there have been no successful attacks since 2006), along with the rise of the high-tech industry in Israel — which does a great deal of business digitally and over the Internet and is largely impervious to the day-to-day conflict — has meant that even without peace, Israel can enjoy a very peaceful existence and a rising standard of living. To put it another way, the collapse of the peace process, combined with the rise of the wall, combined with the rise of the Web, has made peacemaking with Palestinians much less of a necessity for Israel and much more of a hobby. Consciously or unconsciously, a lot more Israelis seem to believe they really can have it all: a Jewish state, a democratic state and a state in all of the Land of Israel, including the West Bank — and peace. Friedman is absolutely right that the collapse of the Oslo process and the violent Arab reaction to Israel’s unilateral withdrawals decimated the Israeli “peace camp.” But he somehow manages to ignore the causality involved. The peace camp lost influence because their prescription, when it was followed, led to war instead of peace. The theory was tested, the Arabs’ bluff called, and the truth was revealed: it is the Palestinians and their supporters who “believe they really can have it all.” Why accept one of two states when you can have all of one? So much for logic. Moving into the realm of interpretation, Friedman follows the line first put forward by Israel’s enemies and now by the Obama administration — today there’s little distinction — that Israel only pretends to want peace, but in truth prefers empire. I would put things differently: I would say that Israelis have accepted the painful necessity of a continuous state of war, because they have no other option. They know that there is no Palestinian leadership — not now and not on the horizon — that is prepared to offer any peace other than the peace of the grave. As the father of a young man who has done his share of fighting and who will be called upon yet again for the next war, and probably the one after that, I can absolutely guarantee to Friedman that Israelis, who either go to war themselves or send their children, do not choose to see peace as a ‘hobby’. The suggestion that they do is offensive. The issue that should make peacemaking a necessity rather than a hobby for both the U.S. and Israel is confronting a nuclear Iran. Unfortunately, Israel sees the question of preventing Iran from going nuclear as overriding and separate from the Palestinian issue, while the U.S. sees them as integrated. At a time when the U.S. is trying to galvanize a global coalition to confront Iran, at a time when Iran uses the ongoing Palestinian-Israeli conflict to embarrass pro-U.S. Arabs and extend its influence across the Muslim world, peace would be a strategic asset for America and Israel. This is a really stupid argument, but one that the Obama Administration and its echos keep repeating. The US doesn’t need to ‘galvanize’ the conservative Sunni regimes, because they are already scared to death of the Iranian nukes. And since it is impossible to solve the ongoing conflict with Israeli concessions — remember Oslo, Gaza and South Lebanon — the only way that we can read this is that the US expects to gain influence in the Muslim world by imposing more and more Israeli withdrawals and concessions. Unfortunately, as we’ve seen, this leads to war rather than peace. War, I’m sorry to note, is a positive thing to many of Israel’s enemies. Even though Israel is militarily superior, the US and the international community can be counted on to stop a war before anything permanent is changed — and when they don’t have time, as in 1967, they work assiduously afterward to reverse any changes. Every war chips away at Israel, socially, economically and diplomatically. The Palestinian and Arab leadership, as well as Iran, are prepared to make sacrifices if they will lead to ultimate victory (they are especially happy to sacrifice Palestinians; but that’s another article). There has been a lot of — how to put this — crap in the media lately in support of the Obama Administration’s new policy turn against Israel. And it has the administration’s fingerprints all over it, even when it comes from supposedly independent journalists like Tom Friedman. When Binyamin Netanyahu visited the White House last Tuesday, he was not treated like the Prime Minister of just any banana republic. He was treated like Manuel Noriega. No interviews, no photo-ops, no dinner, and a whole pile of demands. He and Defense Minister Ehud Barak were lucky not to have been locked in a room and forced to listen to heavy metal at top volume. …now it has become reasonable to ask whether the Obama White House is running amuck on Israel, whether it is pushing friction so far out of proportion that it is starting to seem a vendetta based on hostility and ideology. I think it is the worst moment in U.S.-Israeli relations … going back to Eisenhower-Ben Gurion in ’56. I won’t go into why the probable demands — see Rubin’s article linked above — made by Obama are so unfair: a complete and permanent end to construction in East Jerusalem and Judea and Samaria, and more prisoner releases and other concessions to a Palestinian Authority (PA) which has never responded to such gifts and which seizes on every US demand as another excuse to harden its position and refuse to engage in negotiations. But I do want to talk about the US strategy. The Obama Administration’s argument that they are trying to get talks restarted won’t wash, for at least two reasons. First is the fact that pressure is only being applied to Israel, not the PA. The result is that the Palestinians are motivated to not negotiate, since that’s the best way to get concessions forced out of Israel while giving nothing in return. Second is that Netanyahu can’t give in on some of these issues (e.g., Jerusalem) even if he wanted to, because his government would not survive (and if it doesn’t, it will be replaced by one farther to the right). I cannot imagine that Obama’s people don’t understand this. Therefore they must be trying to do something different. A clue to what it is can be gotten from the way the various demands were presented, in an atmosphere of humiliation and contempt. Obama is not sending a message to Israel, and apparently he doesn’t care what message he’s sending to the Palestinians. No, just as his infamous Cairo speech was broadcast to Muslim ears, his humiliation of Israel — his offensive treatment of two veterans of the sayeret matkal no less — was intended as music to those same ears. I see this as another ‘gesture’ to the Arabs and Iranians. By spitting on Israel, our President shows them that after all, he’s on their side, and would they please help him out a little with Iraq and al-Qaeda. It’s unlikely that this policy will work. Similar initiatives — like recent overtures to Syria, or to Saudi Arabia after Cairo — have failed, as Arab states simply continue to follow their interests while they pocket the gift presented to them. Iran, of course, continues to develop its nuclear bomb as its president threatens Israel anew every day. Additionally, I am convinced that some, maybe more than a few, in the administration have an antipathy to Israel and get a certain amount of satisfaction from meting out this treatment apart from any rational policy gains. Obama’s message is not lost on Hamas, Fatah’s al-Aqsa brigades, and other terrorist factions, which have stepped up their attacks. It is not lost on the Palestinians and left-wing Israeli and international ‘activists’ who carry on demonstrations in Jerusalem and at the security fence. It is not lost on the Islamic Movement and other extremists among Arab citizens of Israel who want to ‘de-Judaize’ the state. Indeed, Obama’s message may have already killed several IDF soldiers who were ambushed by Hamas and/or Islamic Jihad in Gaza Friday night. 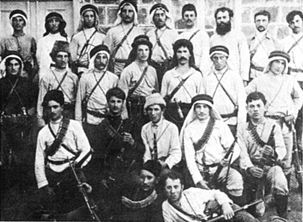 In the early days of the Zionist enterprise, a group of Jewish Palestinians — in those days, the word ‘Palestinian’ referred to Jews — organized a group called hashomer, ‘guardians’ who defended Jewish farms and towns against marauding Arab bandits. Not everyone who applied to join was accepted, including David Ben-Gurion. Today, despite the existence of a Jewish state with police, an army and numerous other security-related institutions, it’s become necessary to recreate this paramilitary organization. In recent years, it has become harder and harder for Jewish farmers in the Galilee and Negev to survive, because they are assailed on a daily (or nightly) basis by Bedouins or Palestinian Arabs who steal everything that isn’t nailed down, destroy fences, set fire to crops, build squatter dwellings on farmers’ land, slaughter their animals in their fields, and threaten, beat or even try to kill anyone who tries to prevent them. These aren’t ‘settlements’, by the way (not that it matters), this is happening inside the Green Line. Here is a video — unfortunately in Hebrew only, without subtitles — of a young man named Yoel Z. making a presentation at a Jerusalem meeting, explaining how he and his friends, veterans of elite army units, have created an organization called hashomer hachadash (‘new guardians’) in order to do the job that the authorities will not or cannot do. He tells of farmers, individuals, kibbutzim and moshavim, simply abandoning thousands of acres of land because they don’t have the ability to defend it. He tells about roads — roads within the state of Israel — that are too dangerous to use because Bedouin bandits block them with boulders and old washing machines, etc., stop vehicles and beat and rob the occupants. Why are the police, army, border police, etc. powerless or uninterested? Yoel’s father, a farmer living on Moshav Tzipori in the Galilee, told him that he had made over 250 complaints to the police and nothing was done. Bedouins have not been particularly political. But the Arabs have always understood that ‘criminal activity’ can also be an effective weapon of war. If Jewish farmers are driven off their land to be replaced by Arabs, the effect is the same as if it were accomplished by conventional warfare. Possibly the Bedouins have been incited to think that soon the land and property of the Jews will be theirs — or maybe they’ve decided this by themselves. “The Arabs are just waiting for someone to tell them whose land it is,” concludes Yoel. Here is the quintessential news story about the ‘daylight’ appearing between the US and Israel. I wrote it myself, but it is based on what I hear on NPR and read in dispatches from wire services like AP. It has been appearing in the pages of my local newspaper in some form or other every day for a week. There are variations, of course, depending on the source. The BBC, for example, will always add the phrase “which are illegal under international law” after every mention of ‘settlements’. Left-wing sources will say that Israel is building on ‘Palestinian land’. But the milder formulation is bad enough. It suggests that Israeli intransigence is preventing talks. Some background: Israel did not take Judea and Samaria and Jerusalem from the Palestinians in 1967. They were occupied by Jordan. Indeed, the Jordanian occupation violated UN GA Resolution 181 of 1947 which said that Judea and Samaria would become part of a Palestinian Arab state and UN GA Resolution 303 of 1949, which called for Jerusalem to be independent, a corpus separatum under international control. Later, UN SC Resolution 242 called for “secure and recognized” borders to be determined in the context of a peace settlement between Israel and the other belligerents of 1967 but definitely didn’t canonize the 1949 lines. Since then there have been other resolutions and understandings, up to UN SC Resolution 1515 of 2003, which reaffirms 242 and endorses the Road Map. The US position today reflects this: final borders will be determined by negotiations between Israel and the Palestinians. Israel has been building in Jerusalem since 1967, and annexed all of Jerusalem in 1980. Nevertheless, various Israeli governments have indicated that they would consider ceding some Arab neighborhoods in the context of a peace settlement. But no Israeli leader has ever countenanced the re-division of Jerusalem by the 1949 lines, which would recreate the conditions of 1948 – 67 during which Jews did not have access to the holy places. Borders will be determined if and when there is a peace agreement which includes “termination of all claims or states of belligerency” in the language of 242. Land that “the Palestinians want” is exactly that and has no special status. Palestinians claim that anything that was occupied by Jordan from 1948 – 67 is theirs, but in fact the Israeli occupation, which was a result of a war of aggression waged against Israel, is legitimate while the Jordanian one was not! There is no legal significance to the 1949 lines. Of course there are areas that are more and less likely to remain part of Israel in a two-state partition (there are also parts of Israel that could become part of ‘Palestine’). The US — until recently, it seems — understood that the Jewish neighborhoods of Jerusalem near the Green Line would end up in Israel, and therefore did not object to building there. The ‘daylight’ between Israel and the US has been introduced not by Israel, but by the US, which has apparently decided to accept the absurd Palestinian position that the illegal Jordanian occupation conferred legitimacy on the 1949 lines. And indeed, this ‘daylight’ has encouraged those who do not wish to negotiate — like Mahmoud Abbas! In Jerusalem, my government has maintained the policies of all Israeli governments since 1967, including those led by Golda Meir, Menachem Begin and Yitzhak Rabin. Today, nearly a quarter of a million Jews, almost half the city’s Jewish population, live in neighborhoods that are just beyond the 1949 armistice lines. All these neighborhoods are within a five-minute drive from the Knesset. They are an integral and inextricable part of modern Jerusalem. Everyone knows that these neighborhoods will be part of Israel in any peace settlement. Therefore, building in them in no way precludes the possibility of a two-state solution. Possibly US policymakers should ask themselves this: if the present situation is so bad for the Palestinians, why are they insisting on new preconditions which prevent negotiations? More to the point, why does the US enable them?